Plants cespitose, not rhizomatous. Culms 35-90 cm tall, 0.7-2.2 mm thick, lower internodes glabrous, puberulent to 5 mm below the nodes; nodes 2-3. Basal sheaths mostly glabrous, margins ciliolate distally; collars glabrous, including the sides; basal ligules 0.2-0.5 mm, truncate, ciliolate, cilia to 0.1 mm; upper ligules 0.2-3.5 mm, rounded to acute; blades to 30 cm long, 1-3 mm wide. Panicles 10-25 cm long, 0.5-1.5 cm wide; branches ascending to appressed, straight. Spikelets appressed to the branches. 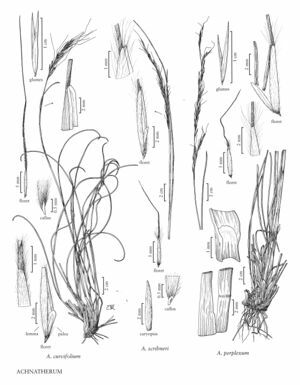 Glumes unequal; lower glumes 10-15 mm long, 0.5-1.1 mm wide, exceeding the upper glumes by 1-3(4) mm; florets 5.5-11 mm long, 0.7-1 mm thick, fusiform, terete, widest at or below midlength; calluses 0.4-0.6 mm, blunt; lemmas evenly hairy, hairs at midlength about 1 mm, apical hairs 1-2 mm, ascending to divergent, apical lobes 0.2-0.5 mm, membranous, flexible; awns 10-19 mm, persistent, once(twice)-geniculate, basal segments scabrous, terminal segments straight; paleas 2.8-5.6 mm, 1/2 -2/3 as long as the lemmas, hairy, hairs not or scarcely exceeding the apices, veins terminating at or before the apices, apices acute to rounded; anthers 2.5-4 mm, dehiscent, not penicillate. Caryopses 3-6 mm, fusiform. 2n = unknown.